College is a wonderful place to learn the medicinal value of fermented beverages and distilled spirits. To avoid debt, I took on a few jobs at a time, weaving them as the warp to my class schedule’s woof. One of those jobs involved some physical labor which would have made OSHA disintegrate in the heat of its own outrage, but the abuse was overlooked because we were teen-aged students needing the dollars; moreover, we enjoyed the adventure. One aspect of that job had us navigating the underground tunnels looking for leaks in the steam system. Pressurized steam is invisible, but a steam leak is usually audible. The thrill of the terror of possibly not hearing the leak was invigorating. I went to a small religious school in Chicago, which is, I might suggest, a beer drinking town. I suppose that doesn’t make it terribly unique, but beer it was for our aching muscles and joints–also for the realization of the possibility of actual bodily harm, which youth, in its wisdom, suppresses until after the battle. The good people at the Miller Brewing Company had just introduced a fine concoction which they named “Miller Genuine Draft.” Pitchers of this golden elixir were available at an affordable price at a Madison Avenue bar which was not particular about enforcing the draconian and prohibitory drinking age laws, so we expressed our love for MGD, as it was known, by purchasing gallons of it at a time. On my twenty-first birthday, we celebrated by buying a pitcher of the more expensive Miller Brewing Company product, Leinenkugel’s Red. It is the 25th anniversary of the release of Reading, Writing And Arithmetic by The Sundays, one of my favorite records (absence of the Oxford Comma notwithstanding). I will not make the case that it is one of the greatest records ever produced because I am well-aware that I was a tender lad of seventeen years when the record was released, and I had just met a very fair lass who was very tall and lithe and had very straight brown hair. She was also the premier DJ at the local teen dance club, where I was not allowed to go because the roads were too icy but she liked me anyway and we started dating and working together at the YWCA, and oh! Records were still awesome in 1990, just before digital storage swallowed analog whole, with music still designed and produced for two sides, five songs a side, maybe a sixth on side 2 (I preferred side 2 to side B because B-sides were for singles, and I had consciously rejected pop music for the haute couture of LPs). 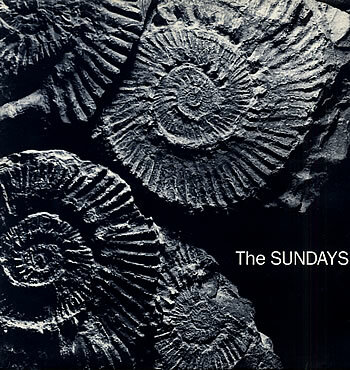 When I spied the curious black and white cover featuring what looked to be fossils, with the simple print “The Sundays” on it, I bought it, put it on my turntable, and began to participate in the baring of a young woman’s soul for the very first time. David Gavurin’s austere arpeggio-style guitar accompaniment is reminiscent of early R.E.M. records, but the tones he chooses are a mellow medium for Harriet Wheeler’s pen and ink vocal stylings, which wander up and down, in and out, lighting and darkening things of the female spirit beforehand unknown to me, and it was just in time for help in understanding this fragile little girl whom everyone loved and bounced around and wanted to play their favorite dance song. She’d oblige if it was Throwing Muses or Pet Shop Boys, or, later, Cocteau Twins. You know, all the greats. Yes, I bought all those records, and they are beautiful to me because of her. I was raised steeped in the ideology that men and women were, except for obvious biological characteristics, indistinguishable in attributes. It was taught to me in school (I swear this is true and not a metaphor) that the differences in the times of the 100-meter dash between men and women were a correlating measurement to the oppression of women. For example, a nation’s women who ran the 100-meter dash one second slower than their men were living in a nation less oppressive than a nation’s women who ran the 100-meter dash two seconds slower than their men. Soon, and very soon, all oppression would be overcome, and women and men would run the 100-meter dash together (cf. G.I. Jane). To hear Harriet Wheeler plaintively ask me if I know that desire is a terrible thing, the worst she can find, but she relies on hers, framing it as a particularly female experience with “I kicked a boy till he cried,” was liberating. To hear it supported by a man accompanying so attentively was inspiring. This thing men and women have is mostly inexpressible, passionate, wild, and unbridled, which means that we create pain in our midst, and the pain wants expression, adding another layer to the inexpressible fires, till she climaxes. The thing about vinyl records on a turntable is the ending. “Joy,” right after “My Finest Hour,” is followed by a moment of that wonderful vinyl sound, which is almost indescribable, then a bump, the mechanical wizardry engaging the gears of the turntable, lifting the needle from the turntable to return whence it came, heard aurally through the same speakers as were, moments ago, the rhythms of her joy, surrounding us in warm, vibrant tones. It is a much more satisfying denouement following our climaxing with her in joy than the clanking of a CD changer within a metal box over there on the shelf or the strict digital silence of file storage devices. Reading, Writing And Arithmetic achieves climax. Unfortunately, the following productions, although good, do not bear the fruit hoped for by the planting of this first record. Who knows why? Sometimes seeds planted do not bear fruit, no matter how magical they are.